We’d love your help. Let us know what’s wrong with this preview of Aunt Dimity and the Widow's Curse by Nancy Atherton. It's early April in the small English village of Finch. Lori Shepherd's husband and sons are spending Easter break camping, and Lori is perfectly happy to be left at home with Bess, spared a week of roughing it with a curious toddler. The two attend a village events commi Nancy Atherton's twenty-second cozy mystery in the beloved, nationally bestselling Aunt Dimity series. To ask other readers questions about Aunt Dimity and the Widow's Curse, please sign up. My mother lent me this from her library stack. I have never read another in this series. Is it okay to jump right in with this one? I thought this book was set in the 1990's? There was a reference to the twenty first century. Christina/ The Blog for Teachers, Readers, & Life! I read an article by the author, and I believe she mentioned that it takes place in current times. I know I’ve told this story before, but Aunt Dimity is a special series for me. It is the first ‘modern’ cozy series I ever read. I usually grabbed the darkest, most twisted mystery/suspense novels on the market, but I received an ‘Aunt Dimity’ book as a gift, and eventually, mostly out of pure, and quite skeptical, Aunt Dimity and the Widow’s Curse by Nancy Atherton is a 2017 Viking Books publication. I especially enjoyed this installment, which calls attention to selfless acts of kindness, which often pays off in ways we never thought possible. The characters Lori and Bree meet in Old Cowerton, were well drawn, and the plot is rich with deceptively benign details, that come together quite nicely. I listened to the audio version and totally enjoyed all the English accents of all the gossipy residents of the village of Finch. This was a fun, light cozy mystery which is #22 in the series. This was my first and worked just fine as a stand-alone. I will definitely read some more. I was surprised how much I enjoyed the book. I was very skeptical I must say, but no fear! I especially enjoyed the character of Annabelle Cravens, an elderly demure and seemingly angelic neighbor. I also enjoyed the quilting bee that was held at a schoolhouse. Mrs Cravens was described as "quilting like she was possessed!" She was chatting with Lori Shepard when she blurted out that she had murdered her husband. Aunt Dimity books are dependably comforting and satisfying for me. I found this one more predictable than usual and edging on the saccharine at times, but it's still Aunt Dimity, so what else can I say? As always, I can't wait for the next. This was a very sweet book, which almost hides the savage conclusion that homes for the elderly, such as convalescent homes, are so terrible that a person could prefer jail to such places. Lori is flabbergasted to suddenly receive a confession of a serious crime (murder of course) from someone she had considered a very upright pleasant person who is a real artist in creating quilts. She takes a friend and investigates the confession. She comes to a conclusion but still doesn't know why such a co This was a very sweet book, which almost hides the savage conclusion that homes for the elderly, such as convalescent homes, are so terrible that a person could prefer jail to such places. Lori is flabbergasted to suddenly receive a confession of a serious crime (murder of course) from someone she had considered a very upright pleasant person who is a real artist in creating quilts. She takes a friend and investigates the confession. She comes to a conclusion but still doesn't know why such a confession was made to her. When she discovers why, we suddenly realize that she is showing us how terrible convalescent homes can be. The Aunt Dimity series has been a very favourite of mine since the first book, and while some have been "more favourite" than others, not a single book has disappointed me, and this installment was no different. These books make small town busybodies lovable, and quiet village life funny and exciting, and as someone who grew up in a small town [I only WISH mine had been more like Finch!] I am here to tell you, that is no small feat. The Aunt Dimity books are [I've said this before in reviewing the The Aunt Dimity series has been a very favourite of mine since the first book, and while some have been "more favourite" than others, not a single book has disappointed me, and this installment was no different. The Aunt Dimity books are [I've said this before in reviewing them, but it bears repeating] like that stretched out old sweater that you love in spite of its age, and that you sigh with deep and genuine pleasure over, each time you slip into it. This is exactly how I feel each time I listen to the newest Aunt Dimity [my library gets them in audio book format and the narrator is absolutely perfect delivering them]. I find kindness, sweetness, humour and a perspective on life and the world in these books that is sorely lacking in much of the actual world these days. It is a joyful interlude each and every time I have the chance to re-visit Finch and go on adventures with Lori and her friends and neighbours. We also always receive a lesson - albeit gentle and subtle - on how to be better to one another, and ways to make the world just a tiny bit less cold and difficult. I don't know if Nancy Atherton does that purposely, or if it is just part of how she sees her characters and the world they live in, but it's a lovely bonus for those paying attention, and who are open to a little small-town wisdom. Another delightful addition to the Aunt Dimity collection. Lori Shepherd, our intrepid protagonist, begins another quest for the truth. With the help of her neighbor Bree Pym, her 13 month old daughter Bess, and of course Aunt Dimity, Lori searches for answers about the "widow's curse". For those of you who are new to this cozy mystery series, Lori Shepherd is an American living in the small English village of Finch with her husband Bill, twin boys Will and Rob, daughter Bess and cat Stanley. Well Another delightful addition to the Aunt Dimity collection. For those of you who are new to this cozy mystery series, Lori Shepherd is an American living in the small English village of Finch with her husband Bill, twin boys Will and Rob, daughter Bess and cat Stanley. Well Aunt Dimity lives there too, sort of. Aunt Dimity, Lori's mother's best friend, communicates with Lori by writing in a blue journal. You see, Aunt Dimity is a ghost, a very friendly and wise ghost. She helps Lori, especially when Lori's curiosity and imagination get a little out of control. WHAT a great read. OH MY GOSH I love these books. Every time I think a new Aunt Dimity book cannot be ANY better than the previous one, I am proved wrong, and this one was no exception. So much is going on in this one and I am totally amazed at how wonderful and gracious Lori is, even in the midst of everything that is happening. She is such a great main character, even with all her faults and you cannot help but want to be friends with her. I love and highly recommend both this book AND this se WHAT a great read. OH MY GOSH I love these books. Every time I think a new Aunt Dimity book cannot be ANY better than the previous one, I am proved wrong, and this one was no exception. So much is going on in this one and I am totally amazed at how wonderful and gracious Lori is, even in the midst of everything that is happening. She is such a great main character, even with all her faults and you cannot help but want to be friends with her. These very light, gentle, and enjoyable books are always a fun read. Though the Aunt Dimity books are short and very hit or miss for me, I am glad to say that this book was better than most and packs a very interesting story. Lori Shepard will admit to anyone that will listen that she is gullible. She tries to accept everyone at face value so when Mrs. Annabelle Craven, a long loved village member, admits that she had killed her husband, Lori is both shocked and curious. Not wanting to jump to any conclusions, and with her husband and son’s out of town, Lori grab Though the Aunt Dimity books are short and very hit or miss for me, I am glad to say that this book was better than most and packs a very interesting story. Lori Shepard will admit to anyone that will listen that she is gullible. She tries to accept everyone at face value so when Mrs. Annabelle Craven, a long loved village member, admits that she had killed her husband, Lori is both shocked and curious. Not wanting to jump to any conclusions, and with her husband and son’s out of town, Lori grabs Bree Pym and heads out to Old Cowerton to do a bit of investigating on her own. I know that the premise does not sound too enticing, but Nancy Atherton was able to wind a very interesting “she-said, she-said” story, almost to the point where you cannot figure out who is actually telling the truth. Just understand that old stories and old jealousies die-hard and when you can fit a scenario to your own liking, just about anything is possible. Another awesome installment of the Aunt Dimity series!! Lori, Bree and little Bess go on a girls' getaway but really want to visit a small town called Cowerton to ferret out some long buried information about their elderly friend and neighbor Mrs. Craven! And what a load of information they find! Not all of it is complimentary of Annabelle Craven and some tidbits don't really coincide with the story the old woman gave to Lori in the first place. Did Annabelle really kill her first husband? Who s Another awesome installment of the Aunt Dimity series!! Lori, Bree and little Bess go on a girls' getaway but really want to visit a small town called Cowerton to ferret out some long buried information about their elderly friend and neighbor Mrs. Craven! And what a load of information they find! Not all of it is complimentary of Annabelle Craven and some tidbits don't really coincide with the story the old woman gave to Lori in the first place. Did Annabelle really kill her first husband? Who should Lori believe: The Sunnyside Gang or Craven Manor Cronies? All is revealed when Lori ends her holiday and reunites with her neighbors in Finch. The ending is not what you might expect!! I always love reading the Aunt Dimity books. I would love to have someone like Aunt Dimity to ask advice. She is always the (disembodied) voice of reason! I thoroughly enjoy this series! A quick cozy British mystery I plucked from my mother's stack of library books as this is one of her favorite genres. Light, well-written, and fun; I loved the from beyond journal communication between the protagonist and her late, ghostly Aunt Dimity, which is the premise behind the series, apparently. I wouldn't seek out others in the series, necessarily, as my tastes tend to run darker and deeper, but every now and then it's fun to read a fluffy mystery like this. I've read all 22 AD books. Every summer I look forward to reading the latest book. I still contend that the first book was by far the best book, and really they aren't mysteries, as there is always a logical explanation for the "mystery". They are however charming stories of very interesting characters in what sounds like a town I'd like to visit. It’s early April in the small English village of Finch. Lori Shepherd’s husband and sons are spending Easter break camping, and Lori is perfectly happy to be left at home with Bess, spared a week of roughing it with a curious toddler. The two attend a village events committee meeting and Lori is astonished when the elderly, soft-spoken widow Mrs. Annabelle Craven stands to make an announcement: she’s decided to hold a quilting bee in the old schoolhouse. At the quilting bee, Lori ends up seated beside Mrs. Craven, delighted at the opportunity to learn more about her neighbor’s life in the village of Old Cowerton. But dear, sweet Mrs. Craven’s stories reveal a startling secret about her first husband’s death. Twenty-two books into this long running series, Aunt Dimity and the Widow’s Curse is sure to please fans of the series. The epitome of cozy, protagonist Lori, with Aunt Dimity’s guidance, travels to a nearby village in hopes of finding out the truth about Annabelle Craven’s first husband’s death. Annabelle Craven is a well respected resident of Finch known for her extraordinary quilts. When she requests help finishing one last big project, her neighbors do not hesitate to participate in the quilting bee. Lori is troubled when, as they chat over their sewing, Annabelle confesses to killing her first husband. Faced with the ethical dilemma of confiding in her solicitor husband or keeping the secret to herself, she decides to ferret out the truth herself, taking her toddler Bess and friend Bree along for the journey. Lori has her work cut out for her when she finds the residents of Cowerton fit into two distinct camps – those who do not think for a minute that Annabelle could possibly have committed such a crime, and those who claim that a “widow’s curse” afflicts all who get close to Annabelle. The Aunt Dimity books are exceptionally docile reads. The whole tone of Aunt Dimity and the Widow’s Curse is mild-mannered and serene. Lori never finds herself in any dangerous situation. There is not much humor or crazy antics. Village residents may have definite opinions about Annabelle and the fate of her beaus, but no one lies or double crosses anyone. Atherton’s words will lull you to sleep if you are not careful. I do not mean this as a criticism; the style is even-keel. It precariously balances the line between sweet and saccharine, and it can become overly sentimental. The unraveling of the truth is interesting, the characters quirky, and I found the reason behind Annabelle’s confession a heartbreaking commentary on the predicament our aging friends often face. The characters, recurring and new to this book, are all likable, even the ones whose outer layer are unpleasant. Recommends it for: I do not think that I would recommend this particular book. I was given a copy of this book by the publisher and Netgalley in exchange for an honest review. In the 22nd Aunt Dimity book, Lori is enjoying time with her little girl while her husband takes her twin boys camping. When a member of the village suggests a quilting bee, then shares an impossible story with Lori, she.is quickly roped into another mystery. Traveling to a new village, Lori and her friend Bree are told of the widows curse that follows her elderly friend, but cannot believe the storie I was given a copy of this book by the publisher and Netgalley in exchange for an honest review. Traveling to a new village, Lori and her friend Bree are told of the widows curse that follows her elderly friend, but cannot believe the stories. Of course Lori cannot stop asking questions, especially of her deceased Aunt Dimity, until she finds the truth. Audio. This was a fun book to listen to on audio. Just found this series. Might look for more! A new Aunt Dimity book always makes me happy. In this book, Lori sets out to a new location, the village of Old Cowerton, to find out the truth behind a shocking secret revealed by a Finch resident. Once there, Lori finds out about the Widow's Curse. Without revealing any spoilers, I'll just say that the reader along with Lori learns that the Widow's Curse is not what you think it is. Ms. Atherton deftly brings a serious issue into the story. If only all our communities could react as the reside A new Aunt Dimity book always makes me happy. Another enjoyable read from Atherton. I do like this series, although it is a bit hit or miss sometimes. I like to see how she manages to introduce new characters in such a small town, and this one was done quite well. I love the idea of a huge quilt that they all can work on, and how they make an event of it. My grandmother used to quilt, and we use her quilts everyday, so I can empathize with how Mrs. Craven feels about her creations. When Mrs. Craven announces to Lori that she killed her admitt Another enjoyable read from Atherton. I do like this series, although it is a bit hit or miss sometimes. I like to see how she manages to introduce new characters in such a small town, and this one was done quite well. When Mrs. Craven announces to Lori that she killed her admittedly awful first husband, Lori is taken aback, to put it mildly. After talking to Aunt Dimity and Bree, she sets off with Bess and Bree, and Dimity of course, to Mrs. Craven's hometown. They are ensconced in a very delightful hotel, and begin their investigation. They quickly find out that there are two sides to the story, as usual, and that gossip is more of a heavy handed tool here, rather than the good spirited, keep an eye out for your neighbors brand found in Finch. As I have a father who is in assisted living right now, the descriptions of the care of the elderly and the risks of outliving your income did hit home. There are no easy answers, but this is not the place for that discussion. Just be kind and aware of those around you, in the Finch-y way. I always feel good while reading an Aunt Dimity story. This one has such a sense of community that it makes you feel Finch is even more special that past books have said. It really is too bad that the characters and Finch are fictional. I would enjoy living in a place like Finch and having a friend like Lori Shepherd. Mrs. Craven holds a quilting bee to which all of Finch is invited. On one Saturday they finish quilting a masterpiece of a quilt. Mrs. Cravwn spends time instructing each person who I always feel good while reading an Aunt Dimity story. This one has such a sense of community that it makes you feel Finch is even more special that past books have said. It really is too bad that the characters and Finch are fictional. I would enjoy living in a place like Finch and having a friend like Lori Shepherd. Mrs. Craven holds a quilting bee to which all of Finch is invited. On one Saturday they finish quilting a masterpiece of a quilt. Mrs. Cravwn spends time instructing each person who comes to the quilting bee, so they can gain confidence sufficient to participate. Near the end of the day, Mrs. Craven tells Lori a story that she killed her first husband. It puts Lori in a dither and leads to Lori, Bree and Bess going on a girls getaway to Old Cowerton where Mrs. Craven spent her whole life before moving to Finch. There are two camps of opinion about Annabelle Craven in Old Cowerton. Lori and Bree set out to find out the truth. Confession: I downloaded this audiobook by accident (I kept clicking on a slow-loading webpage, and my impatience was punished). I didn't realize until I updated my Goodreads that it's the 22nd (!) book in a series about "Aunt Dimity." So I didn't know what most people reading it probably do: it's a cozy mystery in the first person, and the main character Lori talks to her dead aunt via an old magic journal. As a general rule, I'm not into the paranormal thing, and I wasn't thrilled when 40 page Confession: I downloaded this audiobook by accident (I kept clicking on a slow-loading webpage, and my impatience was punished). I didn't realize until I updated my Goodreads that it's the 22nd (!) book in a series about "Aunt Dimity." So I didn't know what most people reading it probably do: it's a cozy mystery in the first person, and the main character Lori talks to her dead aunt via an old magic journal. As a general rule, I'm not into the paranormal thing, and I wasn't thrilled when 40 pages in Lori starts communing with the dead and confiding in a stuffed bunny named Reginald. I also struggle to summon any interest whatsoever in either quilting or baked goods, both of which carried ridiculously heavy weight in the plot. What little remained of the story hinged on childcare (Lori has a toddler) and gossip. 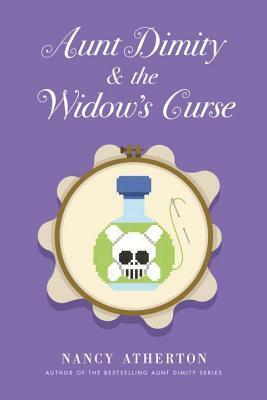 Aunt Dimity and the Widow’s Curse is another brilliant addition the Aunt Dimity series. Although I read numerous other books in this series already, I am reviewing the latest installment first because I just read it, and it is fresh in my mind. This book is a charming, cozy mystery that follows plucky protagonist Lori Shepard and her late Aunt Dimity. Aunt Dimity was a close friend of Lori’s mother that comes through paranormally in a diary and gives advice when Lori has to investigate a situation. While this is a series, the author fills the readers in at the very beginning so that you can read this as a stand-alone book. This book transports us to a quaint English Village near Finch. Lori lives with her husband Bill (who runs the European division of his family’s law firm), her twin sons Will and Rob, toddler Bess, and the family cat, Stanley. Mrs. Craven is well-mannered, kind, helpful, and a skilled quilter. She is a well-respected member of the Finch community. Therefore, Lori is horrified when Mrs. Craven reveals that she brutally murdered her alcoholic and verbally abusive first husband, Zach Trotter. Still, in shock, Lori consults Aunt Dimity through her journal. Aunt Dimity suggests that Lori goes to Old Cowerton, where the alleged events happened, and gather information from the local villagers. When Lori arrives in Cowerton and starts an inquiry into Mrs. Craven’s history, she quickly learns that Mrs. Craven is a polarizing legend within this village. As Lori begins to delve deeper into the past, will Mrs. Craven turn out to be a cold-blooded “black widow” killer? This is a must-read book for Aunt Dimity fans! As a bonus, there is a mouth-watering recipe for Minnie’s Melting Moments on the last page. If you get invited to a quilting bee any time soon, and yeah, I know, the odds of that happening are right up there with you getting an invitation to fly with Elon Musk to Mars, but if you do, you probably don’t want to handle things the way poor Annabelle Craven did in the fictional quilting bee in the fictional village of Finch. As her needle flew through the material, she announced quietly to her seat mate, Lori Shepherd, that she, Annabelle, had murdered her first husband and buried him in t If you get invited to a quilting bee any time soon, and yeah, I know, the odds of that happening are right up there with you getting an invitation to fly with Elon Musk to Mars, but if you do, you probably don’t want to handle things the way poor Annabelle Craven did in the fictional quilting bee in the fictional village of Finch. As her needle flew through the material, she announced quietly to her seat mate, Lori Shepherd, that she, Annabelle, had murdered her first husband and buried him in the rosebushes. This is the 22nd book in the series, but if you haven't ventured into it, note that Lori is an American who, with her husband, came to the small English village to live some years earlier. By book 22, they have three kids. Bill Willis, (Lori didn’t take on his last name when they married), has gone camping during Easter break with their two sons. Lori is just as happy not to have had to go; roughing it wit a toddler isn’t her thing. She and the little girl remain at home, and it’s while the family is separated that the quilting bee occurs and with it the horrifying confession from Mrs. Craven. Knowing that she can’t solve the mystery of the murder herself, Lori turns to the pages of an old journal wherein resides the communicative ability of Aunt Dimity. Aunt Dimity was Lori’s mom’s friend during World War II. Both her mom and Aunt Dimity are dead, but Aunt Dimity is able to manifest herself in the pages of the old journal. And she is excellent at solving those mysteries with Lori. So it’s to the journal Lori goes to learn what Aunt Dimity would do were she corporeal. Naturally, Aunt Dimity encourages her to investigate the story to determine its veracity. With her friend, Bree Pym, Lori bundles the baby up and off they go to the village where the murder was supposed to have happened. What they find is startling indeed. The village of Old Cowerton is sharply divided on the reputation of Annabelle Craven. Some say she is indeed a killer; others insist she isn’t. So wherein lies the truth? And if Annabelle isn’t a killer, why would she lie to Lori? The story was interesting. I am finding it hard to pinpoint exactly what I did like about the story. Here are a few thoughts. I was surprised to discover Aunt Dimity’s secret and wanted to know more about it. The story of what happened to Mrs. Craven was interesting. I liked the recipe at the end of the book, can’t wait to try it. I almost put this book down and didn’t pick it back up, but I am glad that I did. After reading the first three chapters I was wondering when the story was going to start. I generally have a rule that if a book hasn’t grabbed my attention after three attempts to read it, the first three chapters, and the first thirty pages than I don’t finish the story. This book failed to grab my attention, but I wasn’t completely disgusted or bored with what I read. So I kept reading. Chapter four offered a little redemption. The story finally starts when Mrs. Craven admits to Lori that she killed her first husband. Lori considers herself an amateur sleuth and she sets out to uncover the truth of what really happened. That is she sets off on the adventure and in chapter eight she finally gets to it. From this point on the story stays slow, but it stays on point and the reader learns information about Mrs. Craven and what happened to her husband. -1 star for the delay in the story. Without considering the first few chapters that felt like they were added to increase word count and make the story a printable length I still felt a little let down by the story. There are several characteristics I look for in a story that keeps me intrigued and engaged in the story. Nancy Atherton’s “Aunt Dimity” series is one of my favorites, and this - the 22nd in the series - did not disappoint. Lori Shepherd and the residents of Finch are taking part in a quilting bee, organized by Finch resident and master quilter Annabelle Craven. Lori is excited to work with Mrs Craven, and learn more about her. Her excitement quickly turns to dismay however, when Mrs Craven privately tells Lori that she killed her first husband because he was a very bad man! Lori is torn as to wheth Nancy Atherton’s “Aunt Dimity” series is one of my favorites, and this - the 22nd in the series - did not disappoint. Lori Shepherd and the residents of Finch are taking part in a quilting bee, organized by Finch resident and master quilter Annabelle Craven. Lori is excited to work with Mrs Craven, and learn more about her. Her excitement quickly turns to dismay however, when Mrs Craven privately tells Lori that she killed her first husband because he was a very bad man! Lori is torn as to whether or not to believe the elderly woman. On the advice of Aunt Dimity, she decides that more information is necessary. There are series that have stayed around too long. And there are series that hold their own book after book. While the Aunt Dimity books have had some strange repeats and have stretched our ability to stay with a story, they are always been well presented, developed and entertaining. Our main character has had her problems with understanding and interpreting the clues of many of the events. And she often misses the important ones right up to the end. Yet she always comes across as an intelligent There are series that have stayed around too long. And there are series that hold their own book after book. While the Aunt Dimity books have had some strange repeats and have stretched our ability to stay with a story, they are always been well presented, developed and entertaining. Our main character has had her problems with understanding and interpreting the clues of many of the events. And she often misses the important ones right up to the end. Yet she always comes across as an intelligent, concerned searcher for the truth with enough sense to know she is either off the right track or just missing something that is almost there but not quite in sight. She has never taken tea with a vicar (although she drank an Orange Squash with one once) and she doesn't plan to continue writing after her allotted time on earth (though such pla Nancy Atherton is not a white-haired Englishwoman with a softly wrinkled face, a wry smile, and wise gray eyes, nor does she live in a thatched cottage behind a babbling brook in a tranquil, rural corner of the Cotswolds.